A fast and effective way to wash any dog. Save time and avoid getting soaked as you clean and condition your pet in record time. This great tool combines a thick and durable sponge with high quality shampoo so you will be able to wash every inch in half the time. Simply get it wet and squeeze to release the perfect amount of soap for each bath. The thick lather is full of great ingredients that will clean, protect, soothe and condition all in one easy step. Your dog will love it because his skin will be less irritated and less prone to hot spots, and you will love it because it will make bath time quick and simple. Each bone-shaped sponge is good for at least six uses, but most folks will get several more. It has been used and approved by professional dog groomers, and the pH balanced formula contains aloe vera and tea tree oil for a fresh scent and a healthy coat. Gentle yet effective formula is pH balanced. Thick suds make for easy washing. Built in conditioner leaves fur soft and shiny. Thick sponge with rounded ends is easy to hold and allows for maximum control. Tea tree oil helps to prevent itchy skin and prevents infection. Less time in the bath means less shaking, splashing and mess making. All in one formula prevents hot spots and eliminates the need for extra shampoos conditioners and coat additives. Use warm water and thoroughly saturate your dog's fur. Remove outer packaging from sponge, and get it wet. Squeeze a few times to release soap and build suds and activate infused ingredients. Begin bathing your dog at the tail and work your way forward. For ease in cleansing, work from top to bottom as you move forward. Be careful at the face area. Wash only the outer ear. Avoid eyes, nose and inner ear. Once clean, rinse thoroughly with warm water. When rinsing, work from front to back. Start at the neck, and move to the rear. Rinse from the top down and make sure to get underneath and between the legs. Use a towel to blot excess water and then rub all over to dry the best you can. Keep pet in warm area until all the way dry. Allow for complete air drying of sponge between uses. store away from moisture for later use. Replacement is recommended once the shampoo runs out, but the sponge would be useful for longer. Get at least six baths out of each one. An easy way to show your best friend how much you care. 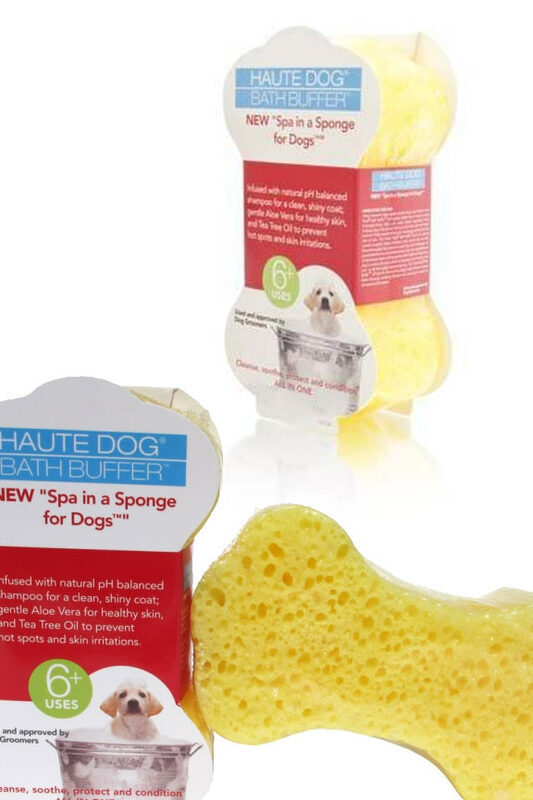 This product will pamper your pet and make your job easier at the same time. Stop dreading the chore of washing your dog, and don't make her wait six months between each scrub. The all in one formula and easy applicator will enable you to speed through the job, and the high quality ingredients will provide lasting benefits. Instead of some cheap shampoo that dries out fur and irritates skin, this one has top quality ingredients to soothe and protect in one simple step. Just wash all over with the sponge and resulting bubbles, and you will not only remove dirt and other grime, you will also condition fur and treat skin too. Order Yours Today! Dimensions 6" x 3.25" x 2"
# Uses 6 or more. 4-in-1 Yes. Clean, soothe, protect and condition in one easy step. Integrated Buffer Yes. The white side gently scrubs to eliminate dry spots and dead skin cells and leave feet soft. Wash your pet with less effort and do it in half the time! This great tool combines a high quality sponge with a safe and effective shampoo. Once wet, a thick lather will form allowing you to quickly wash and condition their coat in one easy step. Order Yours Today! Pet Stuff - Find other good stuff for your pet.